Established in 1990, in the heart of the vibrant and bustling area of Bruntsfield, Edinburgh. We are proud to have gathered a reputation for providing a high quality, desirable and above all stylish jewellery design. McDonald Greene is a business partnership between Suzanne McDonald and Sandie Wilson Greene. 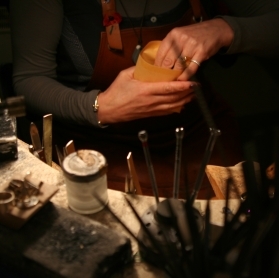 After leaving their respective Art College backgrounds, they met whilst freelancing in Edinburgh in 1988, after a successful two year collaboration decided to set up a unique city-based business offering jewellery design, manufacture and repair. Both have B.A. (Hons) in art and design and went on to study gemmology with the prestigious British Gemmological Association of Great Britain (F.G.A.). This is an in-depth two-year study of gemstones and their occurances leading to a post graduate year to gain a diamond diploma (D.G.A.) enabling the partners to offer a comprehensive and educated valuation service and identification of gemstones.